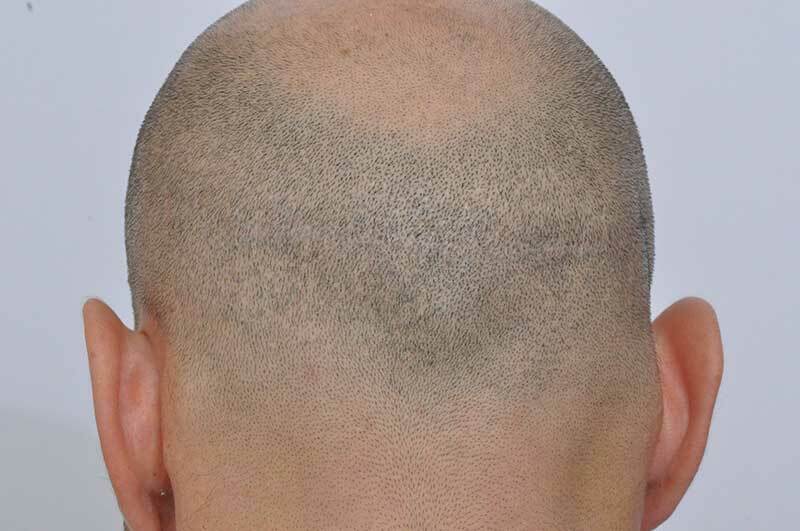 The patient had also SMP into his scar, He said and I quote "My wife cannot find my strip scar with my hair buzzed down! 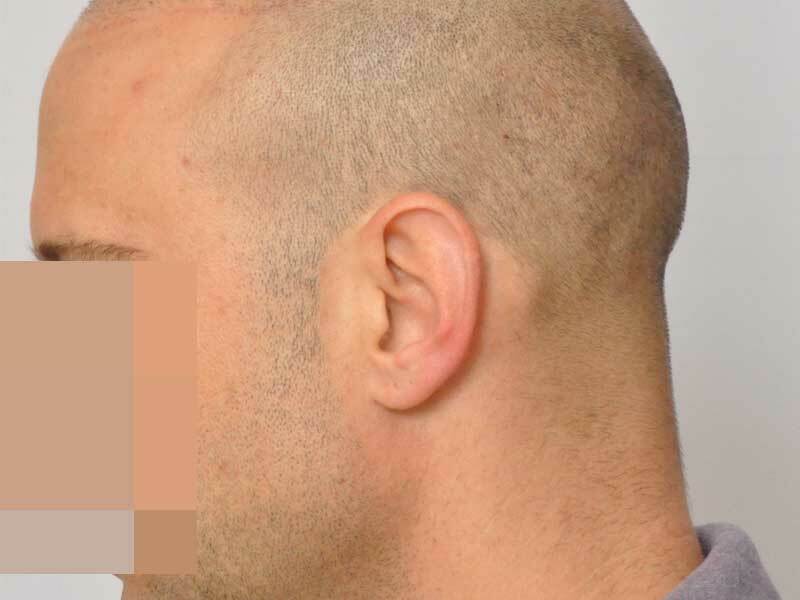 This patient had a single strip procedure performed by a famous doctor for dangerous work in Israel. However, this doctor is frequently invited to speak at international conferences all over the world. While the strip scar is bad, the graft work is worse. 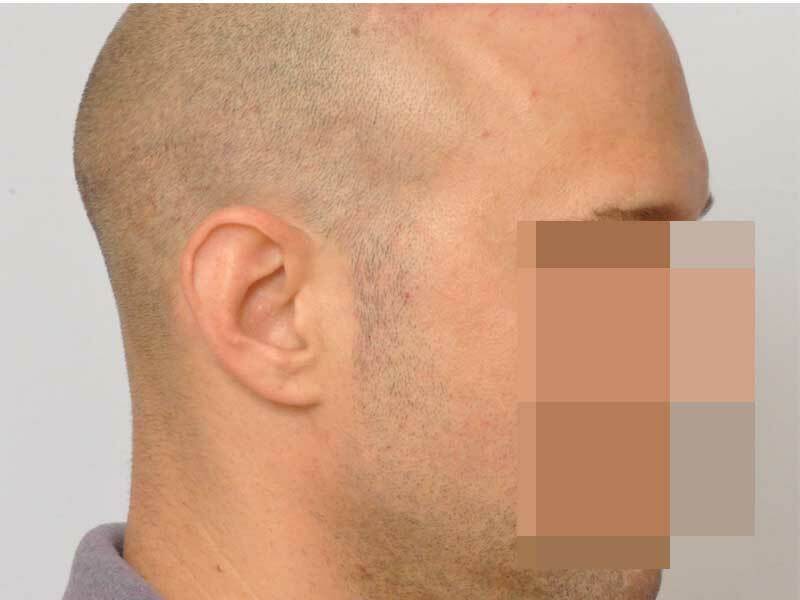 At least with long hair, the patient could conceal the strip scar. Nothing can hide the bad graft work. Ultimately, the only solution for these large, prominent, and pitted grafts is to remove them all. Strip surgeons and those that promote strip surgery including patient advocates, consumer advocates, hair transplant mentors, and websites that recommend physicians for a fee continue to promote strip surgery as the gold standard. Strip surgery is far from the gold standard. 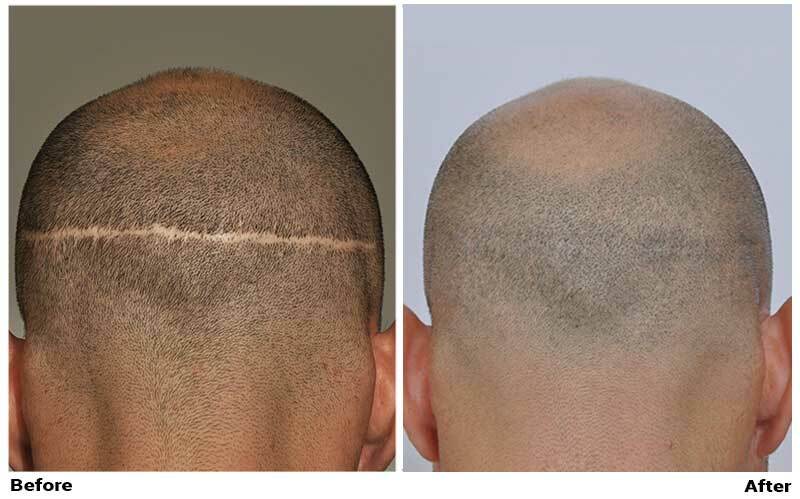 Our studies prove that strip surgery kills hair due to traction alopecia. A significant issue or problem with strips is that the strip can leave a wide scar even after a single procedure. No one can predict the width of a scar though strip surgeons tell their patients that they will get an excellent pencil thin scar. Such is the case in some instances, but wide scars are very common and unpredictable. 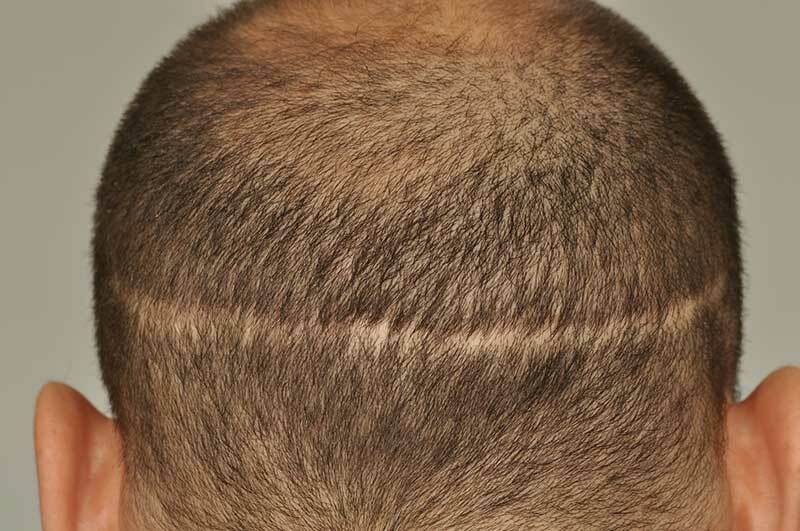 For the number of grafts this patient had, the width of the strip scar is unacceptable. 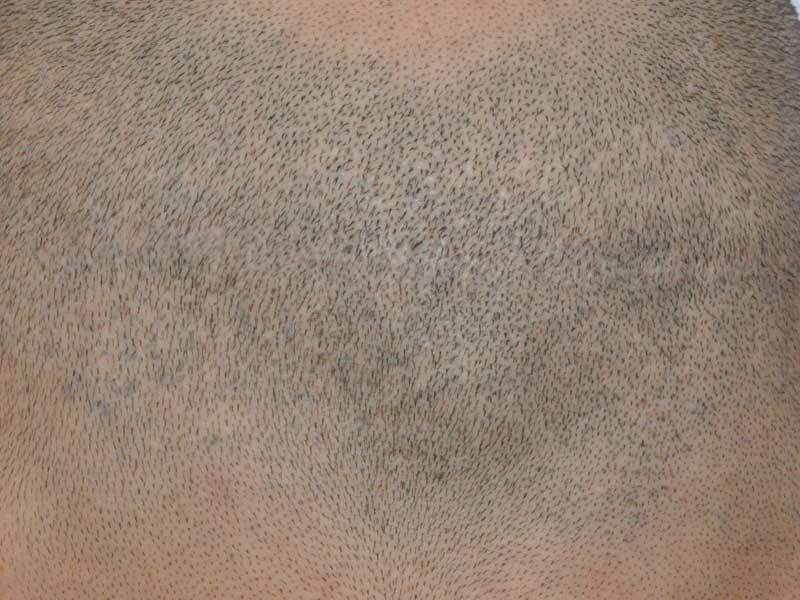 Young men often have a panic attack at the onset of hair loss. These young men often resort to hair transplant surgery with bad doctors in their panic and wind up in a much worse situation. 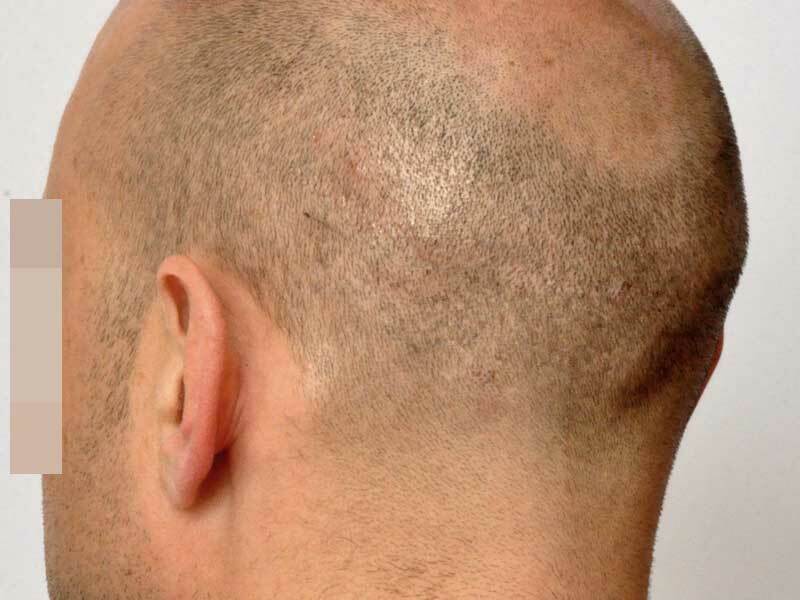 As men mature, get married, and have children, their panic over their hair loss can fade. However, the results of such poor work and the unpredictability of strip scars can leave a life long reminder and embarrassment to patients. Our goal is to correct such horrendous results and protect young men from such ruthless indiscretions by poor doctors. In this case, we had a newlywed man with a newborn. All he wanted to do was to look normal even if it meant an ordinary person with hair loss. 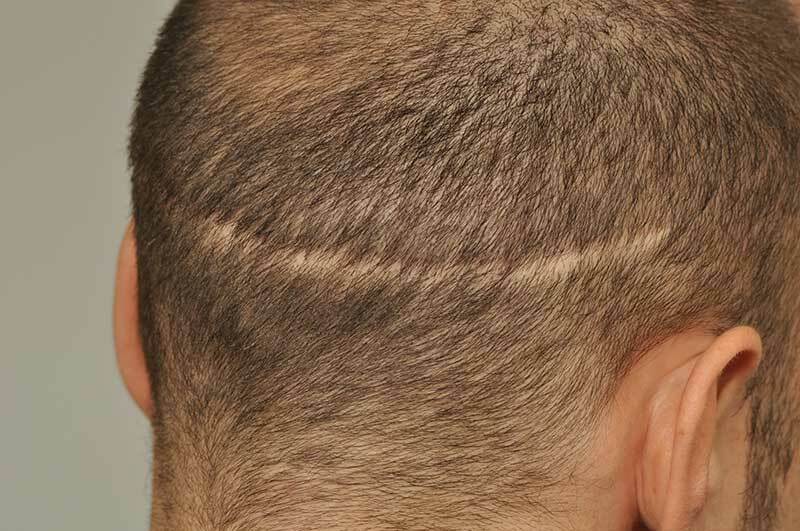 Unfortunately, his strip scar was so vast that we could not guarantee that he could wear his hair to a buzz cut. Fortunately, he had a single strip harvest. Multiple strip harvests also distort hair growth angles so significantly that we can never put the patient back to a normal appearance. 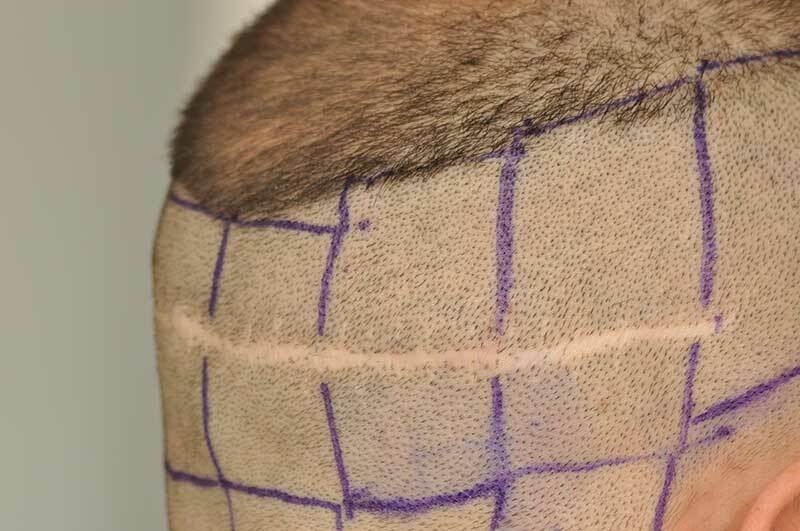 To get this patient to the point that he could shave his head, we had to come up with a creative plan, a plan ahead of its time. Grafting the scar was the first stage of our project. To make the donor area appear as normal as possible, we harvested grafts from random locations all over his safe donor area. This irregular harvesting pattern makes extraction sites harder to see becasue there is no pattern. I call this design the parking lot at the busiest mall in town the day before Christmas pattern. The parking spots are there, but you really must drive around to locate them. Stage two was SMP into the scar and the FUE extraction sites. Step three was to repeat SMP, and stage four was to repeat SMP. 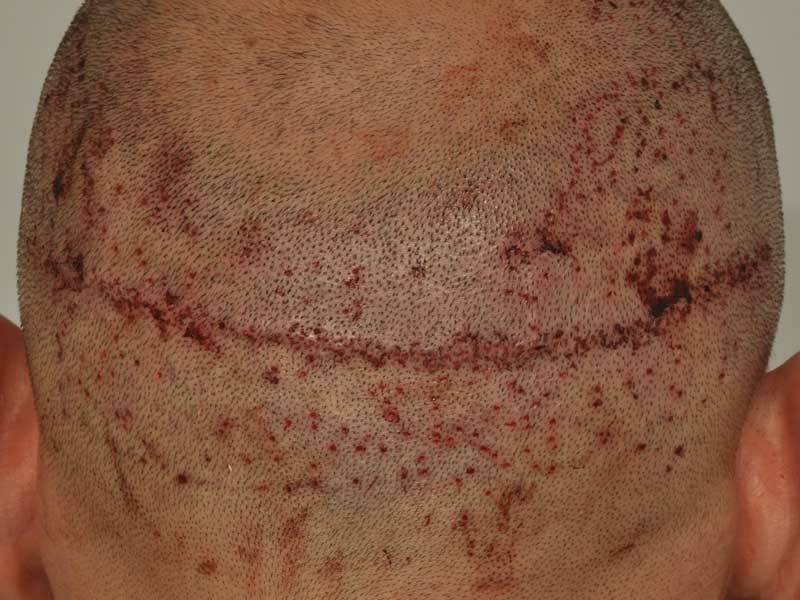 One must blend the SMP not only in the scar but around the scar because strips produce a decreased density around the scar. We have to mimic the density in other areas of the donor area and not just in the scar. There is a lot of creativity with this process. 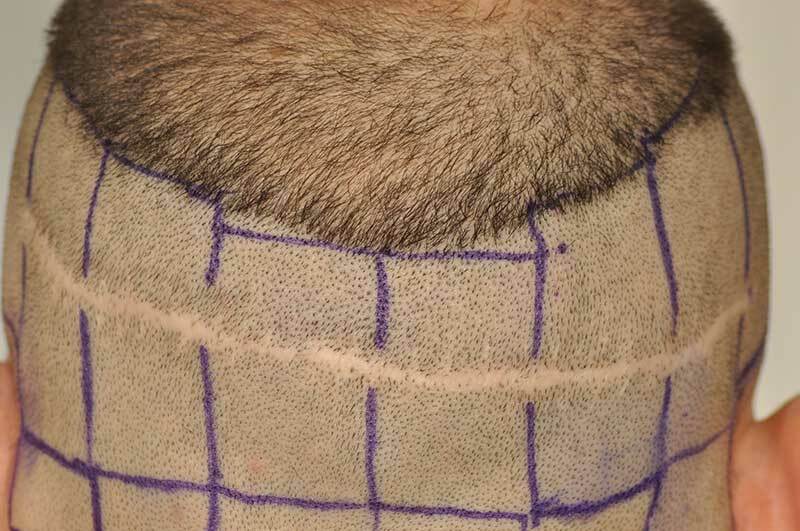 Strips stretch the skin and reduce density around the scar. Pulling skin to compensate for the 1 to 2 cm of skin excised with surrounding follicular units on it is similar to putting dots on a balloon and then blowing it up. With the expansion of the balloon, the dots become wider apart. We must mimic the density all around the scar to create an illusion of an equal density throughout the donor area. Density in the scar alone will not suffice. While we do not depict stage four of SMP, each pass of SMP or grafting improves the donor area even more. It is so much easier to make a donor area perfect if you avoid strip harvesting altogether. Strips are not the gold standard. 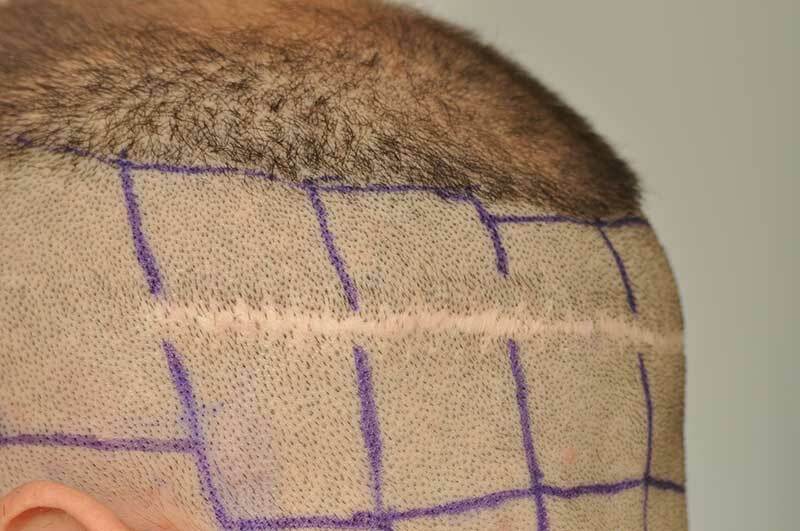 Strips are a disgrace, and those that perform them and those that advocate them are a nuisance and hindrance on the aesthetic advancements of hair restoration surgery. 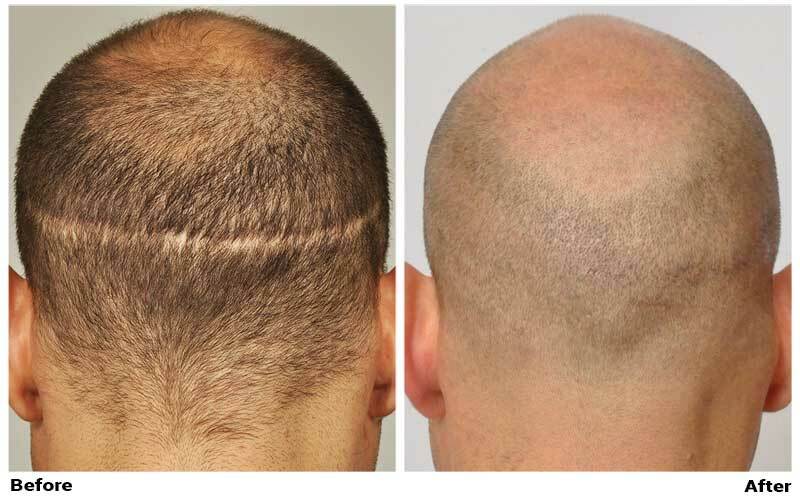 The pictures here show 447 grafts placed in two procedures and three sessions of SMP. Now he can buzz his hair. This was not possible before we developed our combinnation technique of SMP plus FUE. This is a dramatic difference, well done! Strip was never a gold standard, these “doctors” create a big harm trying to fix a problem and most of the times the solution ends far worst than the problem, the saddest thing is that the patient pays to the doctor to get butchered, it’s a nightmare, thank you doctor for remind this, specially useful for the newbies who had the luck to find this forum. Very correctly pointed out Dr Cole. To offer strip surgery as ?gold standard does NOT apply in this time and age. And let me elaborate on one phrase of yours… pencil thin scar. 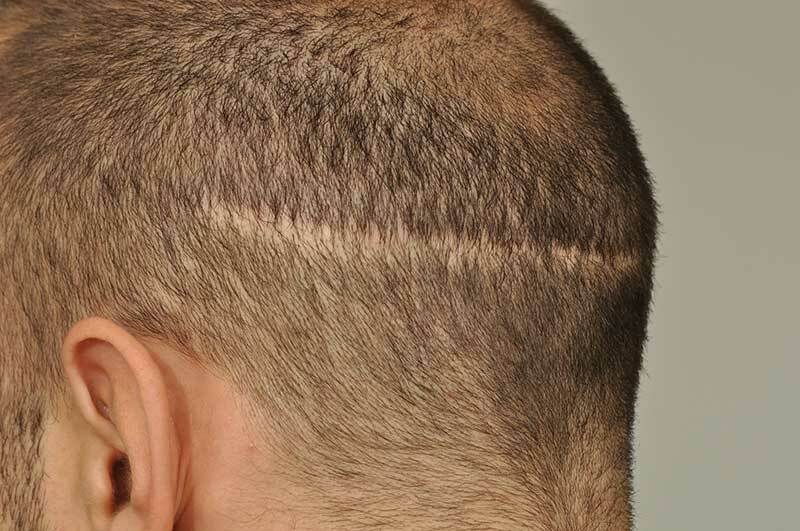 What patients sometimes think is going to be as thin as a line drawn by a pencil… but the doctor actually means the width of the scar would be roughly as wide as a pencil as seen from side. That is as wide as the diameter of a pencil. On an additional note that most patients are not aware of. 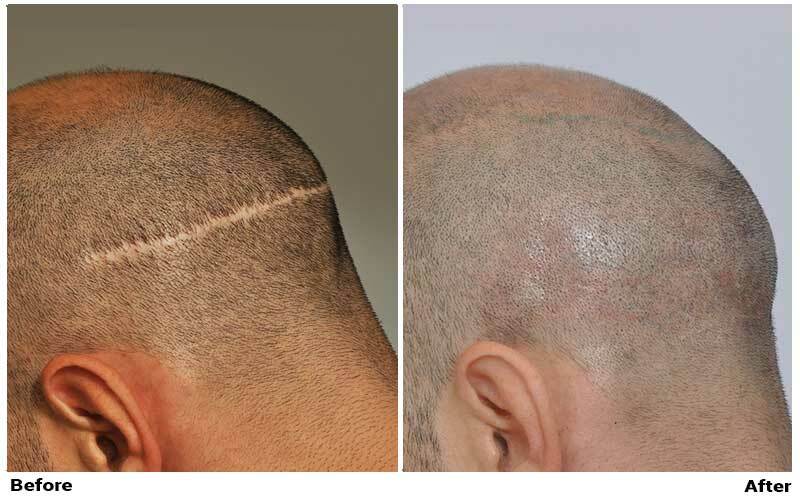 Very few doctors actually want to learn hair transplant from pioneers in the field because as we know it takes time and hands on training as for any other surgery. But there is an entire inverted pyramid. 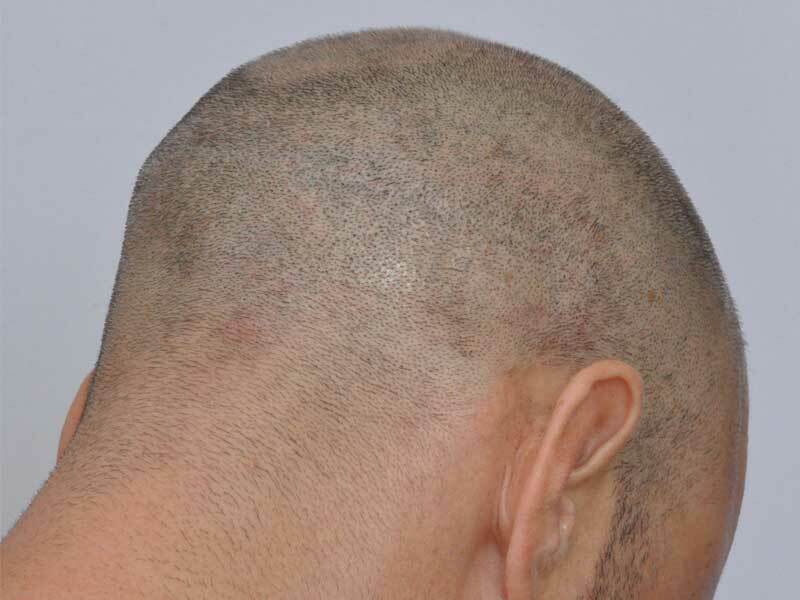 A lethal combination of minimal training (often from youtube), acceptance in various hair societies that allow one to be member without putting a minimum bar of experience with documented results, has led to mushrooming of HT doctors using antiquated techniques and hoping to learn on their patients. That needs to be highlighted. Hi was all this done by Dr Cole? Or by his staff?These photos are amazing and i am considering doing scar repair with you. Hi, of course it was done by Dr. Cole and with his staff assist him . 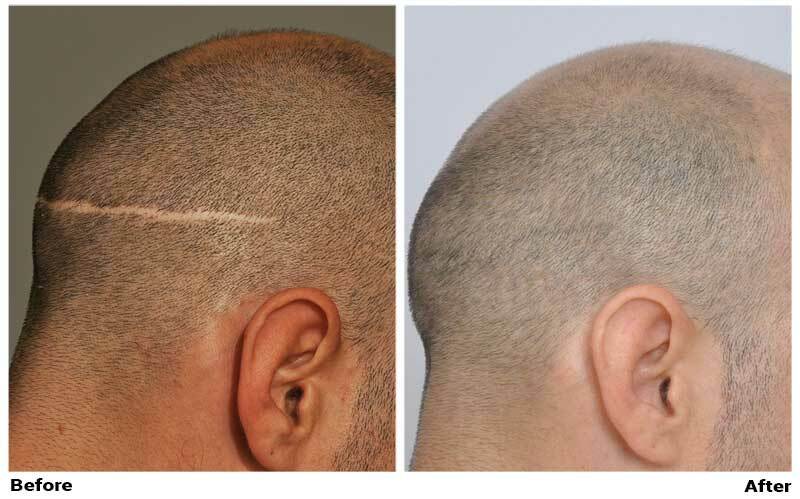 I am interested in doing a scar repair very similar to the one in the photos. About how much would that cost ? I know you cant give me an exact price but a ball park that way i can be prepared. Im also out of state so would have to travel. 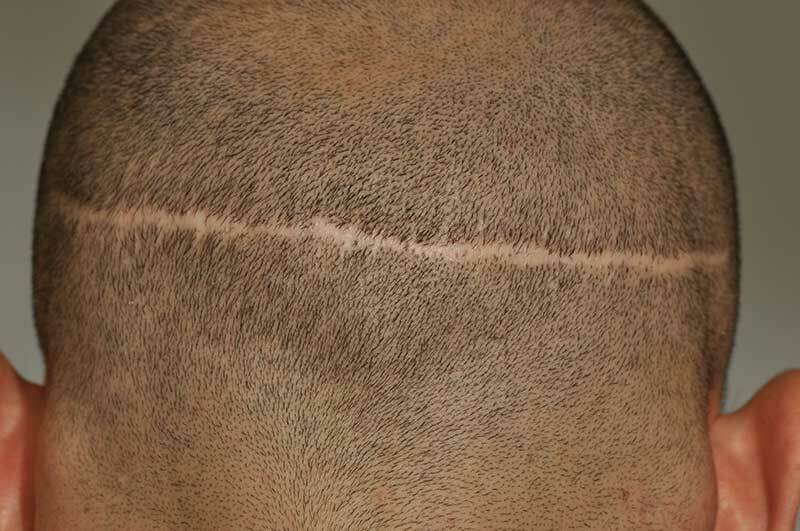 The number of grafts and cost depend on the width of the scar. Generally, you can look at one or two passes, but to get it this good, the second pass of grafts is usually required. Sometimes, we supplement this with SMP to get the result where you can shave the donor area. Scars usually require 300 grafts in a session, but sometimes up to 800 are necessary for very wide scars. If I see your scar, I can give you an estimate. Good luck with the scar. I’ve been no fan of strip scars since 2003.